Emily Hurley shows off a caffeinated work of art made by Braden Walter Jr. (background). Espresso a Mano's tagline says it all: "espresso bar and gathering place." With a neighborhood vibe, inviting interior and energetically friendly staff, this Lawrenceville coffee shop is a far cry from corporate. "We just try to make great coffee and be really nice to people," says Matt Gebis, Espresso's owner. 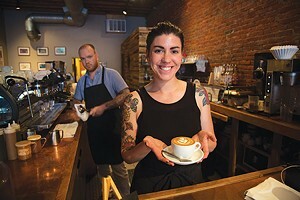 The shop, which opened in July 2009, has become a fixture of Lawrenceville's vibrant Butler Street business district. It's great for a coffee on your way to work, or a few espressos while you do your work at one of its indoor or outdoor tables. "The majority of our customers are regulars, people who live in the neighborhood or pass by here on their way to work or school," says Gebis. "And on the weekends, we have people who make a special trip to Lawrenceville to come here." The menu includes typical coffeehouse staples: mocha lattes, chai lattes, Americanos, an assortment of food items like yogurt and granola, and, of course, straight espresso. "We always have two different espressos, one of which is single-origin which really lets the individual flavor shine through," says Gebis. Espresso's "consistent attention to quality" is one of the main draws for regulars like local resident Zach Furness. "Their coffee is fabulous," Furness says. On a Friday in late September, all of the tables inside and outside were filled. The red-brick walls give the space a cozy feel; they are lined with Italian accoutrements and art from Pittsburgh-based artists. Local is what it's all about at Espresso a Mano. 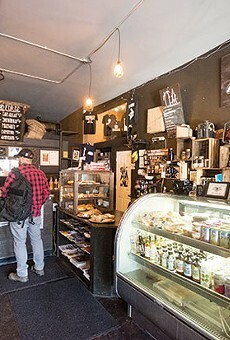 The shop works with five local bakeries. It also gets its granola, milk and yogurt from local suppliers. The coffee comes from sustainable direct-trade and organic-coffee companies like Counter Culture Coffee, Verve Coffee, Coava Coffee, Forty Weight Coffee and Commonplace Coffee. "It feels better knowing the coffee came from a place where people are getting paid a little more," says Gebis. Gebis gained his coffee expertise at La Prima Espresso, the decades-old Strip District coffee shop, where he worked for five years. That's where he developed a love for working in the coffee industry and providing patrons with coffee that is elevated above other establishments'. "I love that two days are never the same," says Gebis. "I get to talk to people every day and I get to offer them a product I believe in." It's a philosophy that Gebis tries to impart to his baristas. He sometimes even sends his employees to an education program offered by Counter Culture Coffee. "There's a farmer who grows these beans. There's a guy who picks these beans. There are some really awesome roasters," says Gebis. "There's a lot of work going into these beans, so it's important for us not to mess it up."